Five transparent storage tubs with blue snap-on lids and removeable dividers. Set of five. 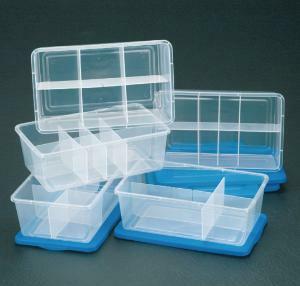 Tub Size: 12 1/2"L x 6 1/4"W x 4 1/4"H.
Short Dividers: 6 1/4" long. Long Divider: 12 1/2" long.